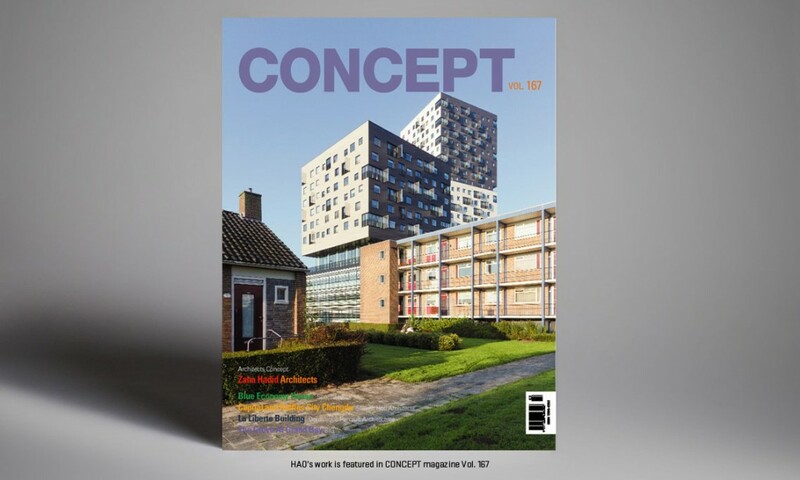 HAO’s design for the DQZ cultural center is featured in Concept Magazine Vol. 167. “The DQZ Culture Center sits on a site in a newly developed area of the city of Daqiuzhuang situated approximately 200 kilometres south of Beijing, China. A rural village in a desolated salty marshland only 30 years ago, Daqiuzhuang has rapidly grown from village to city due to its early investments in and production of the city’s main commodity: steel. The DQZ Culture Center building occupies a redesigned plaza that mimics the historic marshland of the city in its tone and variety of plant life, combining landscape, trees, flexible water features, and gathering spaces into a new urban center with the DQZ Cultural Center at its core. The building takes its form from the traditional Chinese courtyard square. By lifting the square in the diagonal corners, dual entry points to the building are created, leading visitors through the building’s ground level public programs to the mid- and upper-level exhibition spaces while extending the existing North-South axis of the surrounding city.